They have spent five years intensively researching and developing their own patented technology. Their work is based on biologically based materials that are highly renewable, as opposed to using non-renewable chemicals that are based in petroleum. These non-renewable chemicals are typically used in most fiberglass products. Knauf insulation contains no phenol, artificial coloring, acrylics or formaldehyde. The product reduces energy embodied by binders by up to 70 percent and reduces potential global warming and the total amount of embodied energy by at least 4 percent, as they aim to significantly decrease our carbon footprint. By converting natural, organic materials that are highly renewable into completely inert polymers, they aim to provide a superior level of sustainability for the environment. The usage of resources that are plentiful and renewable. The leading percentage of post-consumer recycled glass in the industry. The replacement of non-renewable resources with renewable resources. The eradication of non-renewable chemicals that are based in petroleum. The reduction of binder embodied energy and a lack of artificial colours. The product’s performance is unsurpassed. They have developed cost effective way to improve out acoustical and thermal performance. Knauf insulation is interior friendly and GREENGUARD certified for usage in schools. They provide help to projects in achieving LEED green building certifications. They also follow their own Knauf’s Sustainability Initiative. Knauf Insulation has a vision and mission driven by their overwhelming desire to deliver a sustainable and innovative energy solution that provides comfort, productivity and efficiency. They are consistently striving to improve their technology to meet these goals. Due to their intensive development and research, ECOSE Technology is driven to push the technological envelope and give the consumer a functional, environmentally sustainable product. They deliver the same great features, including the handling and performance you expect from the normal fiberglass insulation products, with a significant increase in sustainability. Knauf Insulation is thermally efficient and provides excellent value when it comes to controlling temperatures, saving energy and lowering your overall costs. Knauf Insulation also reduces the transmission of airborne sound and visually compatible to normal fiberglass insulation. The insulation is durable and tough, able to control condensation, resist fire and avoid corrosion. Knauf’s top notch building insulation, in conjunction with ECOSE Technology gives the consumer the quality, durability and handling that traditional fiberglass consumers have become used to, with a much higher level of environmental sustainability. Knauf’s MBI insulation products are proven to have superior consistency through the roll, no matter the package. 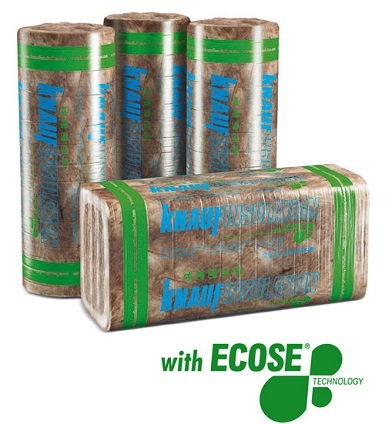 Knauf’s MBI insulation, with ECOSE technology has a fast recovery time, cuts easily, is softer and less dusty than aerolite and has a natural scent that is pleasant for the user.